Usually in games like this one, there's one fact or detail that we can focus on and I can write about as a bit of an introduction. For this game, we again look at the Mariners as a spoiler. Not because it's fun and exciting being the spoiler. Quite the opposite, in fact. Playing the spoiler means your team is out of playoff contention and are playing baseball games because the baseball season is 162 games long and they're kind of obligated. A little over an hour before today's Mariners vs. Angels game got started, the Oakland Athletics lost to the Texas Rangers 9-7. 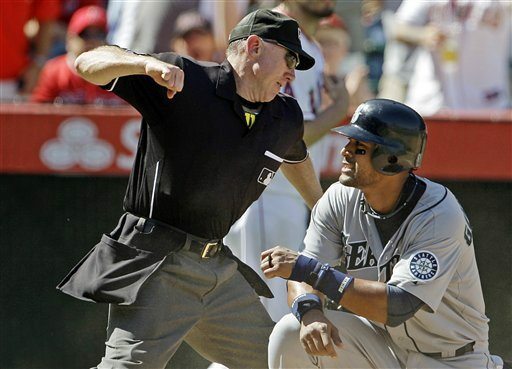 As Mariner fans, you may look at that and think "Big whoop!" That's exactly what you should be thinking, but since I can't control your thoughts yet, you may think what you like. For Angels fans, it was a chance to make up ground. Not only did they not gain ground in the playoff race, they lost to a last place team by 5 runs, which haha, too funny. Today, the Mariners beat the Angels by a score of 9-4 and the Angels playoff chances dropped from 22% before the game to 15% after. That is absolutely delightful. So is the fact that the Angels couldn't sweep the M's in a 3 game series, but the Mariners losing 2 out of 3 is not so delightful. The starting pitcher for the Angels today was Dan Haren. As stated in a previous post, he's been Jekyll and Hyde against the Mariners. None of us had any idea what to expect from Haren, so it was difficult expecting anything from the offense. It's always tough expecting anything from this offense regardless, but doubly so given the pitcher throwing baseballs within inches of the players on our favorite team. The game started out with Haren looking, if not ace-like, at least good enough to already start thinking about what to do for the rest of the evening with no baseball worth watching. Haren's pitches were effective and the offense couldn't get anything going against him through the first 3 innings, save for a Brendan Ryan single in the third. It wasn't until the fourth that the Mariners showed some signs of life. With one on in the top of the fourth and down by a score of 1-0, John Jaso took a pitch deep to right field and over the wall for a 2-run homer to put the Mariners up 2-1. For most left handed hitters facing a right handed pitcher, a pitch in the low inside quadrant of the strike zone is the ideal spot to hit baseballs over fences. At first I thought Haren made a mistake and was trying to hit the outside corner, but no, low and inside was where the target was set. It wasn't a mistake pitch in that he threw it where he wanted it to go, but he didn't bury it far enough inside and Jaso put a good swing on an okay pitch. In just over half as many plate appearances, he has just as many home runs in two years as he has in 2012. When the Mariners traded for him, we knew he was a guy who could get on base and field his position fairly adequately. He wasn't going to be a superstar, or even a start really, but he'd be a useful piece on a team still trying to rebuild. So far, Jaso has exceeded expectations by hitting for a little more power than he has in the past and by being a fairly solid regular. Not bad for a guy that had just 20 plate appearances total in the months of March and April. With any luck, the front office will make the decision I'm sure most of us want and say good bye to Miguel Olivo and hold on to a player under team control through 2015. I think through 2015 anyway. I'm not entirely sure, seeing as how I'm not a front office executive. Watching the game, I still have no idea why Haren was pulled after 5 1/3 innings and only throwing 80 pitches. He'd done a decent job holding the Mariners at bay and wasn't exactly wild by any stretch of the imagination. No matter the reasons, we all got to witness the wonderful bullpen that is the Angels bullpen. After giving up 3 runs (2 earned) in those 5 1/3 innings, the bullpen coughed up 6 runs (5 earned) in the final 3 2/3. There were doubles and singles and errors galore in those final 3 1/3 innings, which I'm sure made us all giggly and feeling a little silly for giggling because of a meaningless baseball game. If you can't giggle at a meaningless baseball game though, you may need some help. Then again, you may not. If I were your therapist, I'd be rich and wouldn't be writing about it on a blog about the Mariners. Kyle Seager, Jesus Montero and Mr. Jaso all added a single double to their individual stat line for the season. Only Seager's wasn't of the RBI variety that leads a team to victory. Well no, there are many other factors, but I put all that effort into writing that sentence, so it stays. Checking in with one RBI apiece were Franklin Gutierrez, Trayvon Robinson and Seager. Montero added a couple add Jaso drove in three to give himself a decent game at the plate. Justin Smoak came up with a single in 4 at bats and drove a couple balls deep into center that wouldn't have gotten out of Safeco either. So you may go back to panicking again, if you wish. Hisashi Iwakuma did his thing yet again for the Mariners, going 6 solid innings, giving up 2 runs (1 earned) on 7 hits, 0 walks and 3 strikeouts. He's lowered his season ERA to 3.32 and I'll tell you something, I know the guy will be 32 next April, but I don't see how the M's can let him just walk away without giving him at least one more one year contract. Better him than Kevin Millwood, which is no offense to Millwood of course, but seriously, go away Millwood. Also worth mentioning is the fact that Guti decided to play chicken with the outfield wall in the bottom of the fifth. Needless to say, he lost that round and had to ice himself down after taking a beating from said wall. After doing this to himself for no reason other than to see if he's indestructible yet, he stayed in the game to finish out the inning. Since his turn in the order didn't come in the top of the sixth, we didn't find out until the bottom of the sixth that he had left the game, with Robinson taking over in left and Michael Saunders taking over in center. We didn't hear any news about why until after the game, when Guti said "I had a concussion before, so now hitting the wall, it was more like precautionary stuff. But I think I'm going to be fine for tomorrow." Wedge also mentioned the fact that Guti "...has no fear of the wall." Hey guys, maybe it'd be a good thing if he had just a tiny bit of fear? Friday's game has the A's and Mariners doing the baseball thing at 7:05pm Pacific at the O.co Coliseum in Oakland. It'll be Blake Beavan and A.J. Griffin on the mound for the start of this 3 game set. Here's hoping Beavan can still Beav and play spoiler against the Athletics too. Actually, no, scratch that. The A's and Angels make me want to cry, but the A's do it far fewer times over the course of the season. Unless it's bored to tears. Yay! Baseball!